Our daughters hugging their bears before giving each one of them away at the SM Bears of Joy. Once again, SM City Bacolod and Toy Kingdom partner for the SM Bears of Joy 2016. This is an annual tradition in all the SM malls, where each mall holds this drive to help bring joy to the children of a particular charity. Last year it was Kalipay Negrense Foundation Inc. and this year it is going to be Welcome Home Foundation. Shawna puts her signed bear on the tree. 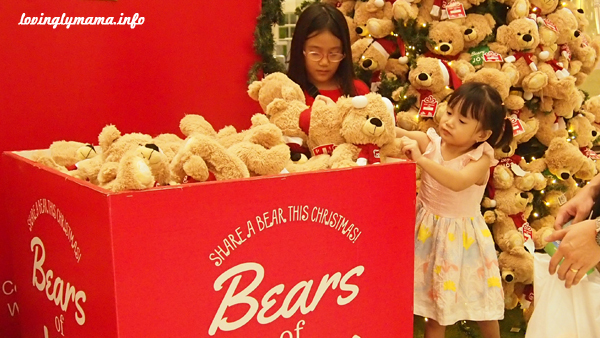 The mechanics of the SM Bears of Joy is that a customer can buy two bears for P199. Each set comes with a couple of gift cards. The other bear is placed together with the completed gift card in the box that will be delivered to an institution or foundation. The other card can be written with a message that can be placed on the red wall (beside the Christmas tree). You can buy as many bears as you want, there’s no limit. We plan on doing this every year and the kids can have one bear to share and one to keep. In a couple of years’ time, our tree at home will be full of bears already. Last year, we also took part in the SM Bears of Joy and had the opportunity to go with the team of the Bacolod mall to deliver the bears at Kalipay Negrense Foundation Inc. It was such a meaningful moment for our whole homeschooling family. And this year we take part again and we are hoping that we will again be able to join the visit next year to the Welcome Home Foundation. Shane places her bear to share inside the box. Again, for us, this is a good way to teach the kids to share. There are many others but one thing that is difficult for a child to share is her toys. While we are blessed with kids who are generous, it pays to let them practice it. This is another practical application of values in our homeschooling in Bacolod journey. 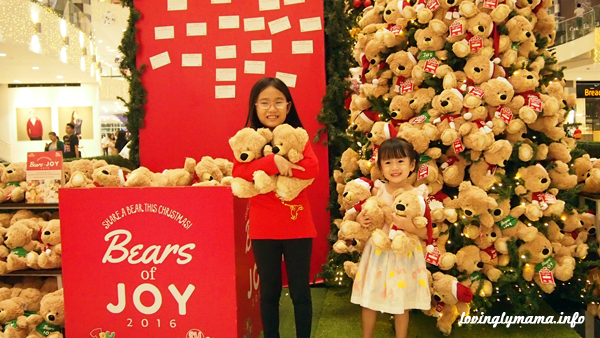 SM Bears of Joy 2016 is available until December 31, 2016 at all SM Malls around the country. In Bacolod, you can avail of it at the SM City Bacolod north wing, events area.